How do I remove rust stains from my driveway? White vinegar can help break down the rust stain. Lemon juice can also be effective. Just soak the area and scrub with a stiff scrub brush. CLR Cleaner or muriatic acid can be used if all else fails. Be careful, especially with the muriatic acid. Follow all of the instructions and make sure to keep it out of storm sewers. Once you have cleaned the surface, make sure to seal your concrete with a good sealer to prevent stains in the future. Until now, you would never think of installing an automatic faucet in your home. However, recently they have become more economical and readily available for home use. So let’s take a look at the benefits and an inexpensive option for the home and find out how difficult it is to turn your traditional faucet into an automatic one. An automatic faucet helps reduce the spread of viruses and bacteria and helps you save water! 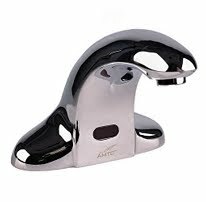 You have undoubtedly used an automatic faucet by now. Most modern public restrooms are now equipped with them as well as other automatic devices such as hand dryers and soap dispensers. The benefit to these devices is simple; they stay cleaner longer and do not allow the transfer of germs and viruses from one user to the next. With all of the current influenza concerns and the outbreak of the H1N1 virus, we all need to do our part to minimize the chances of spreading these diseases. Hands-free faucets can also reduce the amount of water used, which saves money and the environment. They are also great for families with children. They are easy for any child to turn on and they always turn themselves off. They also require a pre-mix valve that combines the hot and cold water before the faucet. This keeps children from burning themselves. None of the faucets that I looked at come with a pre-mix valve, but you can pick them up for about ten bucks total at any local home store or any plumbers’ supply store. If you have flexible plastic water lines, installing the pre-mix valve is a snap. If you have copper lines, it will require a little cutting and pipe fitting. There are a number of commercially available hands-free faucets for the home and they start at about $250.00. I found a decent looking faucet at Sam’s Club for that price. Before I began my search, I was concerned about how difficult that it would be to install an electrical outlet near my sink because of the need for a ground fault indicator outlet. I was surprised at first to find out that almost all of the automatic faucets use batteries. It does make sense that you wouldn’t want a 110 volt outlet right next to your sink. I got the faucet for my downstairs bathroom. This is the bathroom that is closest to my kitchen and used by all of my guests. You install an automatic faucet just as any other faucet. It fits through the holes in your sink and requires that you carefully install the pre-mix valve and water lines to ensure that you do not get any leaks. You may need to use a little Teflon tape to make sure that plastic connectors fit together perfectly. To install the batteries, simply follow the instructions on the faucet. I am not sure how long the batteries last yet, but am very happy with the faucet so far! I am thinking of also getting an automatic soap dispenser. I also love the fact that you almost never had to clean them because you never touch them! Hints on Chester's Clean House are provided "as is" and Chester's Clean House shall have no liability for any damages (whether direct, indirect, consequential or otherwise) arising from the use, attempted use or application of any of the hints described in this blog.